Real country steel guitar is alive and well in British Columbia, Canada! 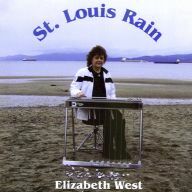 Forum member Elizabeth West wrote a eleven pedal steel instrumentals, then colaborated with studio wizard Don Thompson to record them with a dynamite band. Sho-Bud fans will appreciate the woody tone of Elizabeth's Super Pro-II guitar. Her songs, style and talent bring out that sound we love to hear. Also included is one vocal tune, "Lost Soldiers" - a tribute to those who fought and died for our freedom. Elizabeth wrote, sang and played steel on this tune, which is sure to touch your heart. Elizabeth West's second CD of original tunes shows her continuing growth both as a steel player and as a composer. The songs are, to my ear, more interesting than the first. They are still country, but there's more variety in the chord progressions. I especially like the title cut Skippin Along with its catchy hook. Elizabeth's Sho-Bud is right out front in the mix, backed by a great country band. I guess I'd call this easy listening country because its great background music at work or around the house.